Wow, I haven’t been around in a while. I have been stitching, but have been busier taking pictures of Nathaniel than of my stitching. I am getting closer to a finish on German Garden so I will take a picture to share this afternoon. I am going to stick to that piece until it is finished before moving on to Bine’s RR piece. In the mean time, here are some cute pics of Nathaniel. 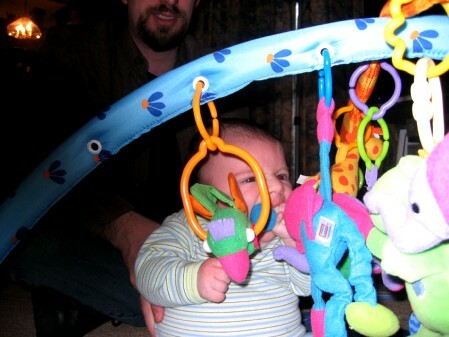 Here he is on daddy’s lap trying to eat the giraffe on his play mat. 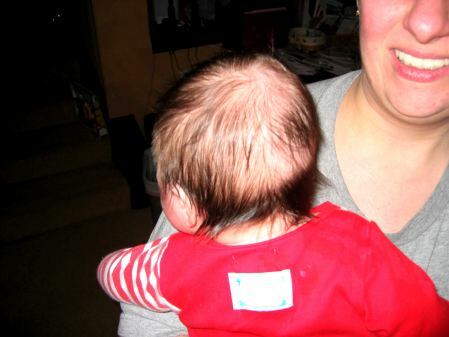 Here is the back of his head which is definitely balding from him laying on his back. Otherwise his hair is staying where it is. 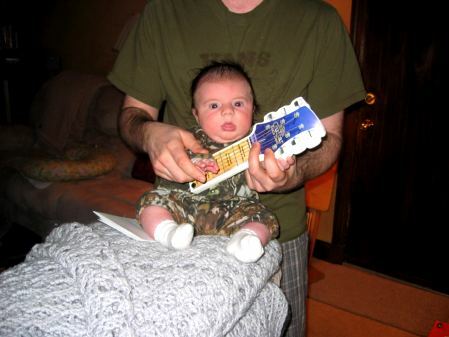 And here he is playing “guitar” with daddy. He is learning some Beatles tunes. In other baby news, he is really becoming a little man now. He smiles pretty regularly when you make faces at him and likes to play with his stuffies on his play mat. The best thing is that for the last two weeks he has been sleeping through the night. By sleeping through the night, I don’t just mean five or six hours, I mean we put him to sleep with only minimal fuss at 8pm and he sleeps until at least 6. There have even been a few mornings when I have had to go in at 8 am and wake him up. Now that I have written that, I am going to go knock on every piece of wood I can find in my home:) I do think that the fact that he has found his thumb is playing a big part in his ability to soothe himself back to sleep at night without crying. Wow ~ how great that he is sleeping so long at night for you! And what a treat. You just never feel quite the same without a solid night’s sleep. He is growing so well and he is just adorable. He is adorable. I’m so glad he’s sleeping through the night. Aaron was really good at that too, he started waking up for the first week he was on solids but is back sleeping through the night now.